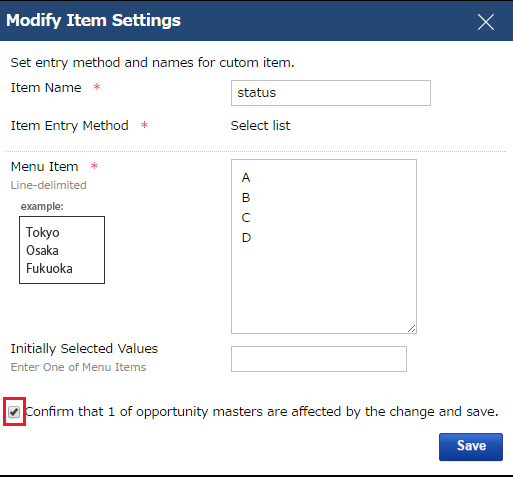 From the list of usable items, you can register, edit, and delete custom items that can be used on Opportunity Masters. To use this function, system administrator level permission is necessary. To use this function, Opportunity (administrator) permission is necessary. The maximum number of items that can be registered to one Opportunity including basic items and custom items is 100. From "Admin Settings", click on "Available Items". 1. Click on "Create custom item". 2. The Create Custom Item screen will come up. Input the necessary information and click on "Save". 3. 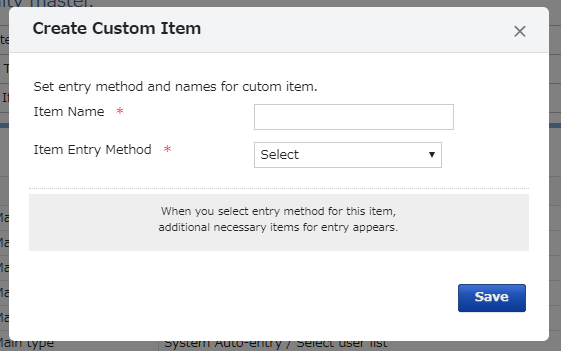 The Item Entry Methods that can be set are as follows. Enter text (Single line) This will create an item for text input. The maximum length of the text can be specified between 1 and 250. Enter text (Multiple lines) This will create an item for text input that allows for line breaks. The maximum length of the text can be specified between 1 and 2000. Select list This will create a list-selection item. You can register up to 50 items on the list menu. The list-selection menu in the initial settings can also be used. Select user list This will create an item for selecting users. Users who display in this list are used for setting the scope of users in the Opportunity Master that include this item. Check box This will create a check-box item. The on / off check status in the initial settings can also be used. Enter number This will create an item for number input. The range of numbers, initial value, and units can also be specified. Enter date This will create an item for date input. The display format of the date can also be specified. This will create an item for specifying files for attachment. For one deal, multiple file-attachment items can be set. For one file of one item up to 10 MB can be uploaded. In one action, up to a total of 51 MB can be uploaded. If uploading more than 51 MB, after uploading, the rest of the uploading can be done from the Edit screen of the deal in question. * Files that cannot be uploaded are files ending in ".exe", ".bat", or ".com". 1. Click on "Modify" of the item you wish to edit. 2. The number of Opportunity masters where this item is being used will be displayed. (You can check these Opportunity masters from "Admin Settings", "(Opportunity Master) List View", and then either "Details" or "Change.") After checking what will be affected, put a check in the checkbox, and click on "Save". Click on "Delete" of the item you wish to delete. A confirmation screen will come up. Press "OK". Please be aware that if there are registered deal masters or deals using this item, this item will be deleted from these deal masters and deals.